This past weekend Harper, my mom, and her friend Jenni and I took a trip to Houston. Mom and Jenni visited the Houston Quilt Show and pretty much shopped till they dropped! While Mom and Jenni had a fun girls quilting trip, Harper and I decided to hang out with my Aunt Jolene and her daughter Robin, and Robin’s girls Sarah and Madeline. Even though we were in Houston for just one full day, we had a blast and ate LOTS OF FOOD! Wednesday night was the Republican debate, Jolene had a neighbor named Jim over to watch the it since his television was broken. It’s kind of a funny sight, looking back…. all four of us (Jim, Jolene, James – an uncle who was in Houston for work, and I) curled on the couch watching the Republican debate with big slices of cheesecake perched on our laps. The cheesecake was amazing! I thought I would be good and not eat the whole slice, but my stomach trumped my brain and said I should finish it. I regretted that afterwards and had trouble falling asleep I was so stuffed, but it was definitely worth it!! The Houston trip was short-lived and we were back in Dallas by Friday evening and ready to trick-or-treat and watch A&M football that next day. Halloween was a treat as the Aggies pulled out a win against the South Carolina Gamecocks, and Harper went trick-or-treating for the first time. 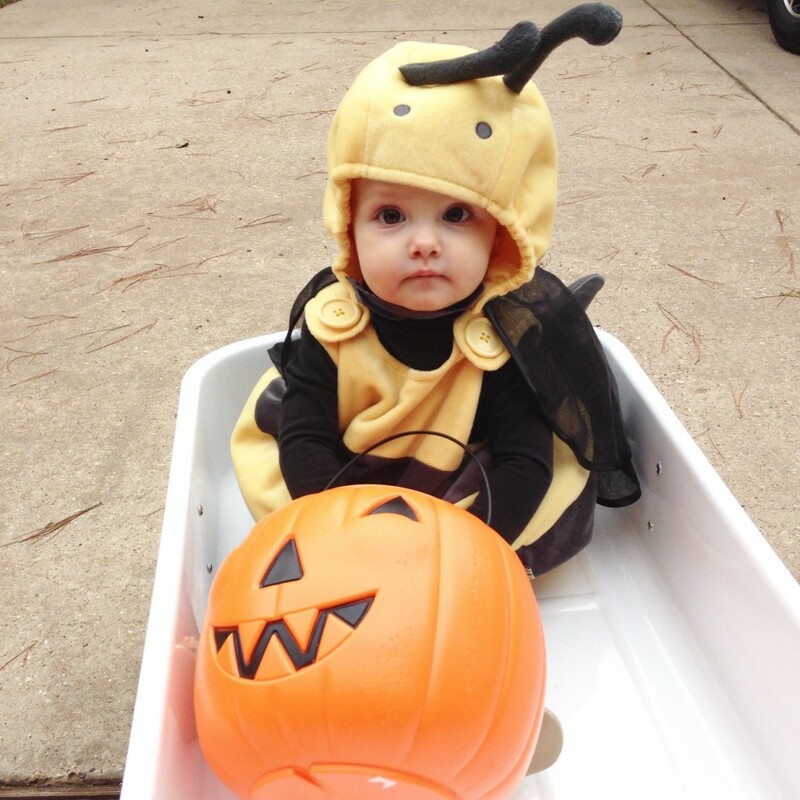 She was a bumble bee! Buzzzzzzzz!!!!!! At one year old, Harper is fearless. Not once did she cry, get scared or fuss. I actually nearly jumped out of my skin when we knocked on a neighbor’s house that had motion-sensored scary music and a fake black snake. Harper – nothing phased her! 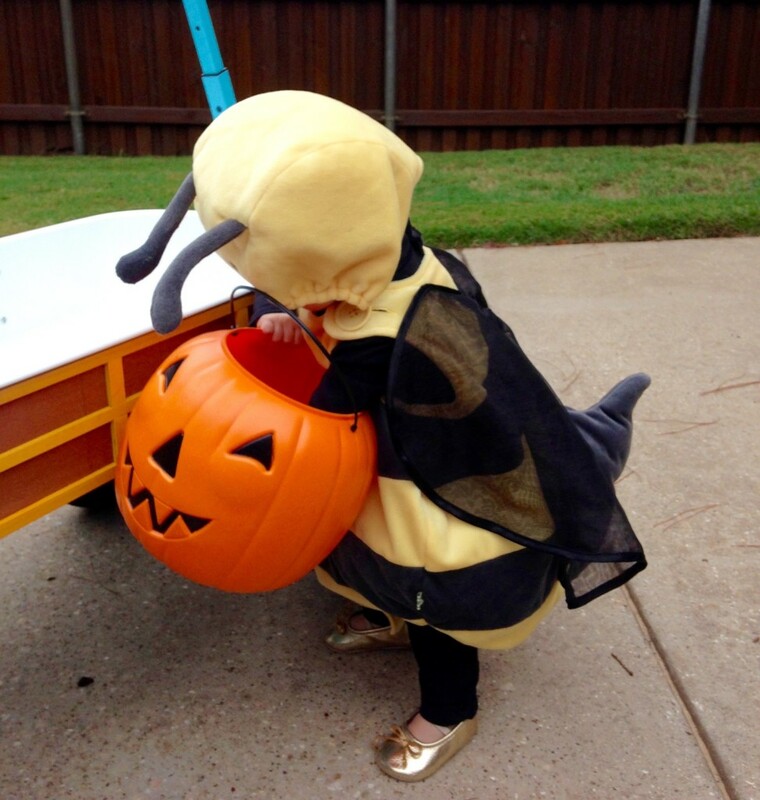 She had a blast looking at all the other kids in their costumes, and enjoyed knocking on doors and picking out candy. When given the option of which candy she wanted, Harper choose a Reese’s Pieces and a Kit-Kat. I think she liked the bright redish/orange colors from the wrappers. Hope you all had a wonderful Halloween. Enjoy! Combine crumbs and butter in a small bowl. Press mixture in the bottom of a greased 9" springform pan. Bake for 15 minutes. Cool in pan on a wire rack. Beat cream cheese, ½ cup sugar and vanilla in a large bowl with an electric mixer at high speed until smooth. Beat in 2 eggs. Stir in 1 cup toffee bits. Spread over crust. 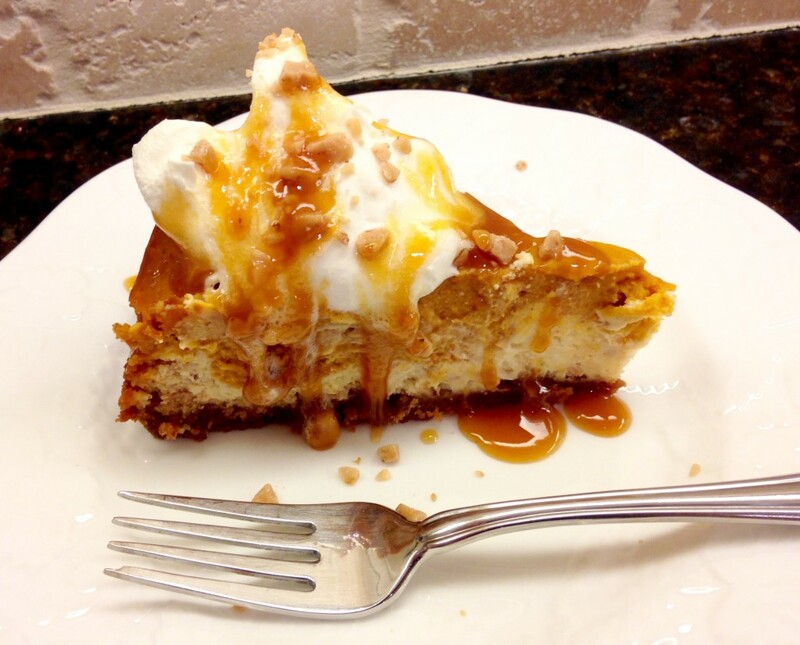 Combine pumpkin, whipping cream, ⅔ cup sugar, cinnamon, salt and remaining 3 eggs in a large bowl until blended. Slowly and carefully spoon over cheesecake layer. Bake 2 hours, or until edge of cheesecake is set at least 2 inches from edge of pan but center still jiggles slightly when moved. Turn off oven; open oven door at least 4 inches. 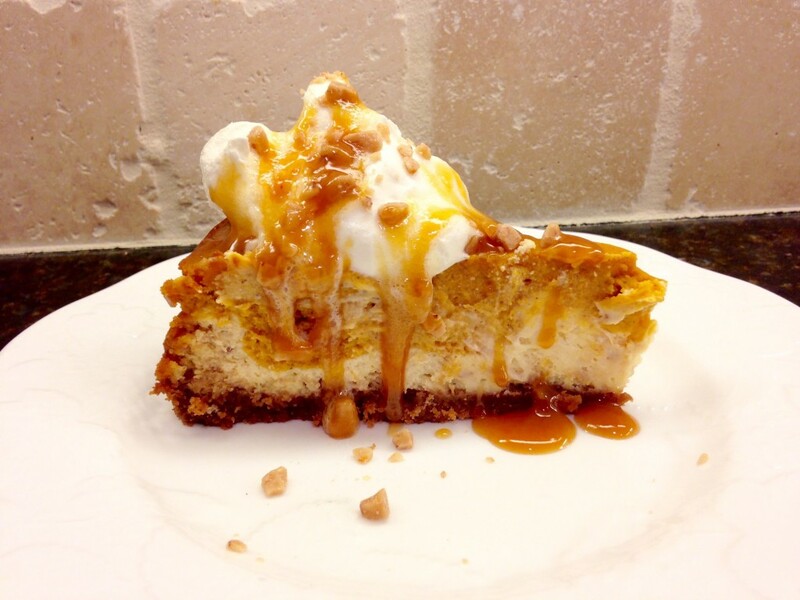 Leave cheesecake in oven 30 minutes. Run spatula around edge of pan; remove side of pan. Dollop servings with whipped topping. 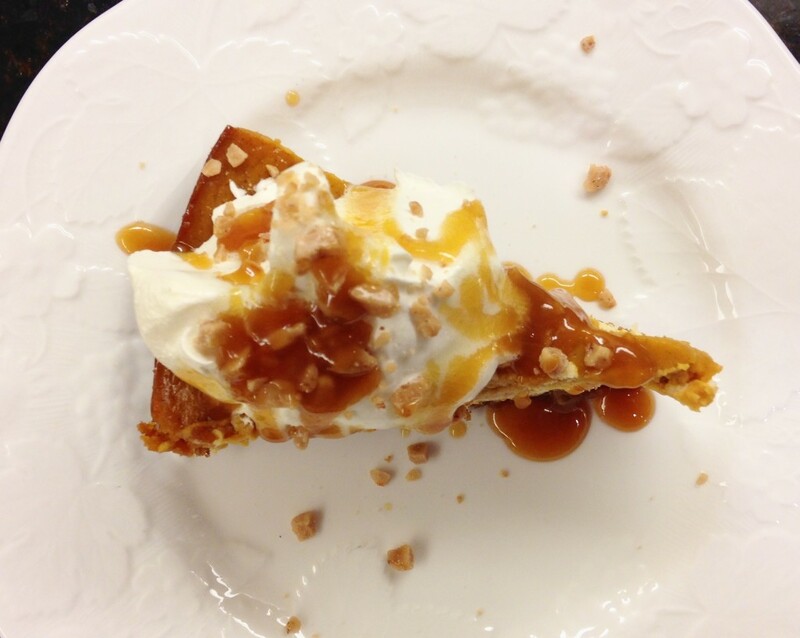 Drizzle with caramel topping; garnish with remaining toffee bits.